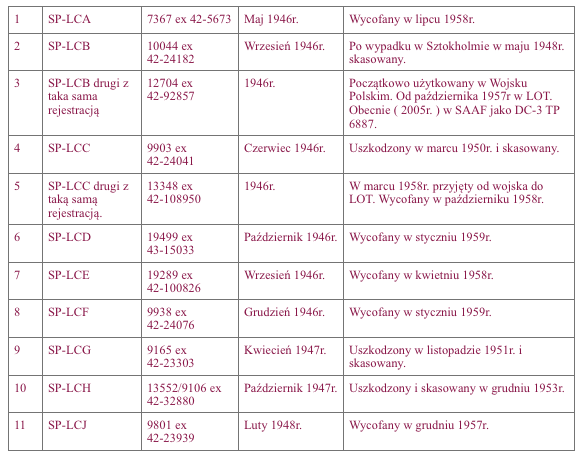 It is very difficult to present a reliable list of Lisunow Li-2 aircraft operated in Poland. The reasons are manifold. 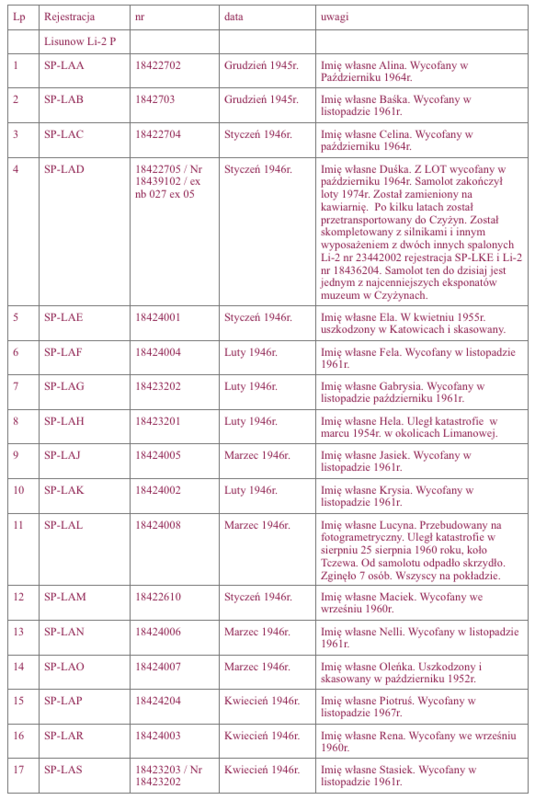 First of all, the planes were transferred between the army and the LOT Polish Airlines company and many times. The second major problem is the confusion of DC-3 aircraft with Li-2 aircraft, and both were used in Poland. There are many publications where the Li-2 signature appears under Polish DC-3. 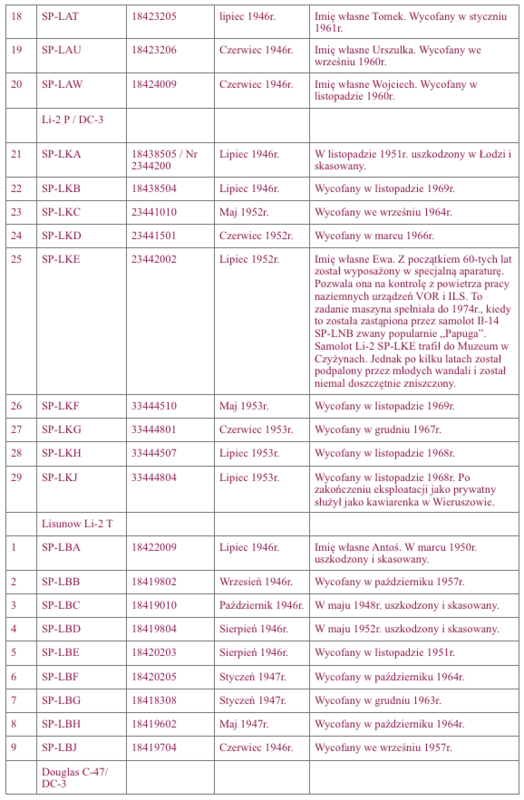 The Polish Army had 17 Li-2 machines. 10 machines have been rented to PLL LOT for some time. Airplanes had a typical military painting. Most of the surface is dark green. The lower parts of the fuselage, wings and horizontal tail are blue. Large chessboards placed in accordance with the regulations; in the rear of the hull, on the vertical body and on the wings. On the vertical tail, also the white serial number and a lot bigger, also the white side number. At the moment when the plane was used by PLL LOT, chessboards and numbers were painted over and painted; registration behind the fuselage and wings, the inscription LOT Polish Airlines above the windows, the PLL LOT emblem on the vertical tail and the stylized Polish flag on the direction of the direction. The Polish Army exploited the Li-2 until 1974. The PLL LOT company had a total of 40 Li-2 machines in stock. There were 9 DC-3 machines in this number. Li-2 aircraft were operated until 1967. The Li-2 planes newly produced and introduced to the PLL LOT position often remained in the natural color of aluminum, and received only all elements of belonging to the PLL LOT company. DC-3 was purchased in 1946 for PLL LOT from the depot. These aircraft received classic painting from PLL LOT. The entire white plane. At the window height, a blue belt with two narrow lines above and below. Above the belt, a large inscription Polish Airlines LOT. Registration in the back of the fuselage and under the wings. A stylized crane in the front part of the hull. Horizontal emblem of the LOT company. These aircraft were used from 1946 to 1959. Most machines were sold, including to Iran.